Japan-ROK relations stand at a great crossroads. What brought about this big test was the ruling issued in October 2018 by the South Korean Supreme Court on conscripted labor or, more precisely, the judgment concerning Korean wartime workers.1 With this, the court has recognized the right of these workers to claim compensation from Japanese firms, arousing an outraged response from the Japanese government and public. Then, in December, a South Korean naval destroyer locked its radar on a Japanese anti-submarine patrol craft, which extended the clash between the two countries to the security arena. Actually, the divide over security had emerged in late September—prior to the conscripted labor decision—with the conflict over the SDF warship’s “Rising Sun” flag. Through this series of events, emotions among defense personnel on both sides exacerbated considerably. 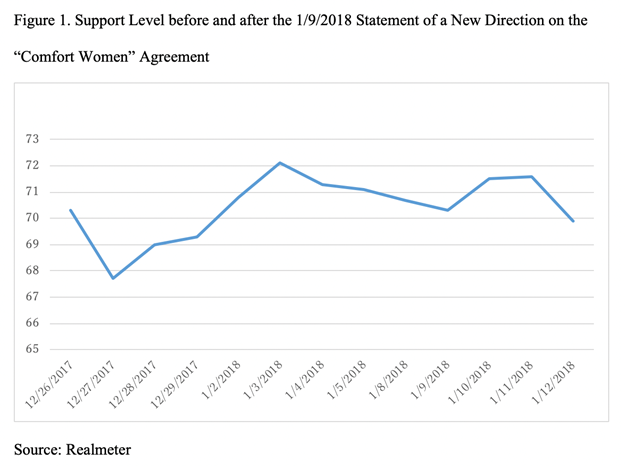 One clear commonality could be found in the fact that the events that riled bilateral relations in this period were almost all started by “South Korean actions.” After the December 2015 foreign ministers’ agreement on the “comfort women” issue, when a comparatively stable situation prevailed in the relationship, this new situation coincided with the period after the Moon Jae-in administration was established. In the background to this situation is Japan’s political stability. The second Abe administration, which was established in December 2012, has maintained long-term stability. Also, in its foreign policy, right after it took power, it raised the promise of “revising the Kono Declaration,” and in December 2013, defying opposition in and out of Japan, Abe boldly paid homage at the Yasukuni Shrine. Yet, the Abe administration subsequently dimmed its revisionist shading, and in March 2015, it swore off revising the Kono Declaration, followed by the so-called Abe Statement in August that not only expressed “deep remorse” over Japan’s conduct in World War II, but also noted that “in the darkness of war the dignity and honor of many women were deeply damaged,” indirectly referring to the “comfort women” issue.2 As a result of the imprint of this sort of wording on historical revisionism by the second Abe administration, the force of the propaganda campaign by Park Geun-hye toward international society concerning the “comfort women” issue was weakened. Consequently, her government in December, under severe US pressure, had no choice but to compensate with the “comfort women” agreement with Japan. The Abe administration firmly intended to press for better Japan-ROK relations. After resolving the “comfort women” issue, which was the biggest concern, it saw no further need to take positive action. Even the movement spreading hate speech via the “citizens’ organization against allowing privileges for the Zainichi community,” which had riveted attention in Japanese society, was quieting down after the 2016 passing of a “hate speech law.” At the time, in Japan there were no large-scale autonomous activities concerning Japan-ROK relations. In spite of this, from the summer of 2018, new actions originating on the Korean side, one after the other, shook the relationship. The feelings of Japanese citizens were deeply wounded. Thus, today’s situation is very different from what it was from 2013 to 2014, when both sides exacerbated the conflict: The Abe administration was then pushing a historical revisionist message, while the Park administration was being severely critical of Japan over the “comfort women” issue. A similar contradictory response accompanied the statement in February 2019 by Moon Hee-sang, speaker of the National Assembly, demanding an apology from Japan’s emperor.8 After some of his statement was reported, Moon tried on one occasion to correct his words, but the US media outlet that had interviewed him had made public a recording. When the details were exposed, he sought to justifying his statement by saying: “I was only presenting my own long-standing opinion.”9 In this way, the Korean side itself could only view the situation as deeply contradictory. Why then, “despite having no consistent plan,” had the South Korean government and those close to it “stirred up Japan-South Korea relations?” Why did the government give rise to these kinds of symbols offensive to Japan? Below, I explore both long-term and short-term explanations. Why did the South Korean government repeatedly act and speak in a way that would be viewed as damaging Japan-ROK relations in a seemingly thoughtless manner? Much of the Japanese media emphasizes that, in the background, there was a government plan trying to raise its support level by taking a hardline policy toward Japan.10 However, this type of conjecture is deeply mistaken. The reason is that in today’s South Korea no matter how relations with Japan are conducted, a situation exists where it will not noticeably affect the support rate of politicians and political parties. As I argued earlier,11 in the Roh Moo-hyun and Lee Myung-bak administrations, there was some influence from government policy toward Japan on support for the president and the ruling party, but that kind of situation disappeared entering the Park era. This reality is more evident entering the Moon administration. 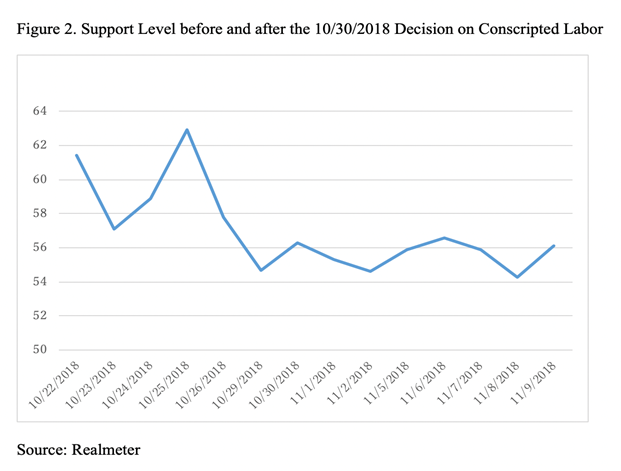 As seen in Graphs 1 and 2, the principal symbols of bilateral relations under Moon, the January 2018 reconsideration of the “comfort women” agreement and the October 2018 Supreme Court decision on forced labor, both had no impact at all on the before and after differences in the presidential ratings. Now, public interest in policy toward Japan is definitely not great; that means it is very difficult to count on raising one’s support level by moving public opinion through a shift in policy toward Japan. 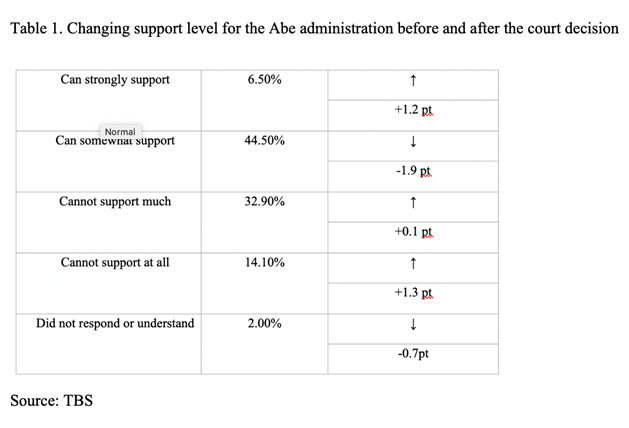 A similar situation can be seen on the Japanese side, e.g., right after the conscripted labor decision, as seen in Diagram 1, in spite of the action being viewed in a Japanese survey at the time as hardline policy. As is widely known, in both Japan and South Korea, because a situation exists whereby one’s government hopes that public opinion will take a tougher stance toward the other side, these data mean that there is no reason on either side to pursue a rating boost by adopting policies that would be expected to have this effect. Why in spite of choosing policies in the hope of stirring public opinion, do support rates not rise? The answer is they are not chosen for the importance of appreciably influencing support rates, which are affected by countless factors. Naturally, in Korea the greatest concern is economic issues, and among foreign policy ones, interest in North Korea predominates. By comparison, one cannot say that interest in Japan-ROK relations is strong. The very lack of importance of issues concerning Japan-ROK relations itself influences the behavior of South Korean politicians on this matter. One way is negative. In response to the series of incidents in bilateral relations, South Korean leading government figures, beginning with Moon Jae-in, refrain from positive statements. For example, since the conscripted labor decision, Moon has only twice spoken on the issue. Once on the presidential plane on the way back from the G20, which took place in Argentina; responding to a question from a South Korean reporter, he stopped at a general comment that “for the sake of historical questions, we must not damage the cooperative relations which should develop toward the future.”12 Moon’s negative outlook on speaking about Japan-ROK relations could be seen in how he expressed himself at the New Year’s press conference on January 10.13 While much of the Japanese media was anticipating on that occasion a message from the president on relations with Japan, Moon totally avoided the topic in his leadoff remarks. His silence on the subject persisted; in the question period devoted to foreign policy and security, he did not recognize any Japanese media for an opportunity to ask a question. Finally, an NHK reporter in the period reserved for questions on domestic politics, intrusively seized the chance to raise a question on conscripted labor that belonged in the diplomatic period, and Moon’s response showed that if not for this reporter’s “out of order” behavior, he was determined to remain silent on relations with Japan. Moon Jae-in is not alone, in the Korean leadership, in exercising restraint in speaking positively about the Japan-ROK relationship. Relying on the spokesperson of the defense department on the question of the locked-in radar, the defense minister did not open his mouth. Similarly, the foreign minister has refrained from positive remarks concerning bilateral relations, to a remarkable degree, while commenting on several occasions about this issue, indicating that for a time only the defense minister would be relied on to resolve the conscripted labor question.14 The reason for them exercising restraint in their remarks is simple. They lack much interest in relations with Japan, as do the media and others with whom they engage.15 This means that it is not the case that pressure applied from public opinion is causing concern about answering media questions on relations with Japan or leading to hesitation in voicing their own viewpoints. The reduced importance of relations with Japan is not the only thing restraining their positive statements and involvement, there is also the destabilizing effects of their words that show concern about that relationship. This is because there is no need to respond with caution, e.g., in the above-mentioned New Year’s press conference, in his response to the question from the NHK reporter on conscripted labor, Moon clearly had not prepared. If he had been conscious that the conscripted labor issue was important and that a possibility existed that a question on it would be posed by the Japanese media, we would have expected Moon to have prepared an answer. In spite of this, in a situation where he had to ad lib a response, we can grasp just how much the South Korean government is staying on the sidelines regarding current relations with Japan. An even more conspicuous sign of how the loss of importance of the relationship with Japan has unsettled statements by persons connected to the ROK government were the remarks of the National Assembly speaker. Moon Hee-sang showed that his response to a question from an American reporter—“Emperor is the son of a war criminal”—had been uttered in an ad lib form, and that there existed no compunctions about answering carefully to a difficult question. It was important that this interview occurred just before the speaker was to pay a visit to Washington. This means that the speaker, even on the eve of important national assembly diplomacy, which should not have been minimized, had no preparation for responding with care to queries on the government’s policy toward Japan. In my past series of writings,16 I explained that for South Korea diminishing Japan-ROK relations is a mechanism for exerting influence on the territorial question and historical consciousness questions. On bilateral matters difficult to resolve, where clashes exist on such questions, there is no clear way for direct political resolution of them. On occasions of new textbook approval and government white papers including commentary on territorial issues, there is no end to disputes arising with a degree of repetition; so in a period when there is no sharp clash between the two sides over these issues, these differences will periodically arise. However, for South Korea when the importance of Japan-ROK relations was clear, when these issues finally arose, elites would move quickly in fear that great damage would be done to the relationship, and they would strive to calm emotions. What especially mattered was Japan’s economic significance for South Korea. 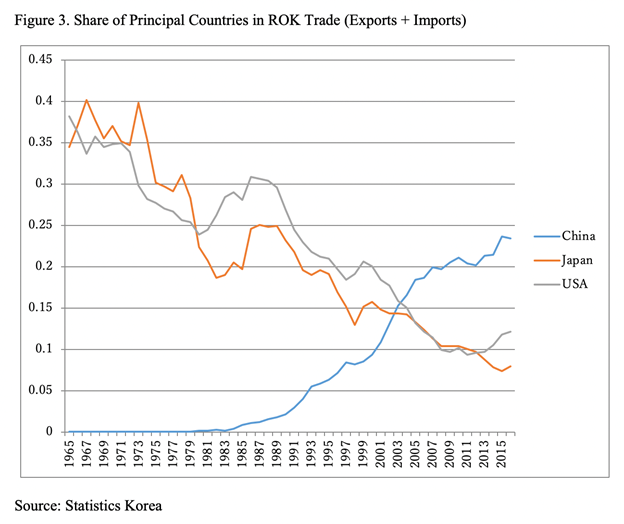 As is clear in Diagram 3, in earlier times for South Korea Japan’s economic influence was extremely large, and it was obvious to everyone that damage to Japan-ROK relations would victimize the South Korean economy. Similarly, it could be said for the security sphere, given the threat posed by North Korea to South Korea, in case of an incident, that the cooperation of Japan, where many US bases are located, was indispensable. Thus, the South Korean elite of the time, fearful of the expanding impact of tensions with Japan, strove in various ways to restore Japan-ROK relations, e.g. there were cases when ROK business circles, who depended on Japan for capital and technology, pressed politicians, taking the form of public opinion campaigns using the Korean media to acknowledge the importance of Japan-ROK relations.17 The problem soon quieted down; both sides avoided its intensification. When Japan’s importance for South Korea greatly diminished, however, this mechanism stopped functioning. Today, when Japan’s position as an economic partner has been much reduced, Korean business circles have lost the will in the midst of worsening bilateral ties to douse the flames that Korea itself has shot forth. As seen in the locked-in radar issue and the Rising Sun flag issue, those in the field of security relations do not have an understanding that today their own actions are exerting a very bad influence on relations with Japan. The incentive to “intervene” by taking early action to calm disputes in bilateral relations has sharply declined; therefore, once a conflict has erupted, it necessarily will persist for a long duration. The explanation offered so far does not suffice. The result of long-term trends cannot explain the worsening of relations that has occurred since the autumn of 2018. The declining importance of Japan’s economy for South Korea is a gradually advancing phenomenon, which cannot be an explanation for the distinct change over a certain time. So, what happened in 2018? To understand this, we need to look back to the history of Japan-ROK relations in the period of the Park administration. She began in 2013 putting the “comfort women” issue at the center, strongly criticizing the historical consciousness of the Japanese side. When Abe later that year visited the Yasukuni Shrine, revealing his revisionist character, bilateral relations were sharply set back, and both countries faced a situation where summits could no longer be held. There was one different characteristic at the time in this conflict between the two parties, i.e, each presented its position on the conflict over historical consciousness before international society, especially on the stage of America, their common ally. Sticking firmly to their positions on the “comfort women” issue, both were trying to press for an advantage over the other in international society, through using pressure from the United States, which wields great influence in both countries.18 The precondition for this situation to arise on both sides was the need for a clear victory by attracting the support of international society, centered on America. Japan’s calculations were simple. They were that it remains the world’s third economic power in GDP, and it is the most important ally for the US in East Asia. Japan’s reasoning was that the time had come when not only China’s economy, but its military as well had gained in strength, and the US absolutely needed Japan’s cooperation in its conflict with China. In contrast, Park Geun-hye’s calculations were that South Korea had been subjected to colonial control by Japan and in WWII it stood on the same side as the allied countries, beginning with the United States, in combatting Japan; thus both share the same consciousness toward Japan linked to the age of imperialism, and America should be readily receptive to South Korea’s case on “comfort women” and other issues of historical consciousness. Today’s South Korea has gained national power, and its presence has achieved greater influence in international society. Therefore, it is capable of competing equally in that arena and even could be victorious, Koreans reasoned. As is well known, the competition centering on Washington ended with Japan’s victory, and as a result, under strong US pressure, in return for the Japanese side offering 1 billion yen, the Korean side abandoned its long-standing advocacy of the right to request legal compensation concerning the “comfort women” issue, and agreement was reached on the issue.19 That led to the following understanding: Although Japan had enjoyed great power from early on through the force of its economic clout, it maintained, as before, great influence in Washington through its long-standing alliance relationship. If South Korean policy displayed some negative advocacy toward Japan, it could involve the United States, whose presence could not be overlooked. When the Moon Jae-in administration began its tenure in 2017, there was again some concern in Japan, symbolized by Moon’s campaign promise to revise the “comfort women” agreement. It was thought that in foreign policy in order to conduct a dialogue with North Korea, which was subject to intense criticism from international society for conducting repeated nuclear weapons and ballistic missile tests and was the center of Moon’s policy goals, he would need permission from the United States.20 At the same time, Japan was not shifting away from its hardline posture toward North Korea, which, as before, showcased the abduction issue. Therefore, if Japan were to conduct a campaign in Washington in opposition to dialogue with North Korea, the possibility existed that it would prove to be a big barrier toward the Moon administration’s quest for dialogue with the North, and any South Korean effort to excessively provoke Japan would be dangerous. Realizing this, Moon started to take a more careful posture toward Japan. Entering 2018, however, North Korea suddenly agreed to dialogue with South Korea, and the US welcomed it, leading not only to North-South dialogue, but also to US-North Korean talks. In April after an 11-year hiatus, a North-South summit was held in Panmunjon, and two months later a US-North Korean summit followed in Singapore. In the background there was energetic South Korean diplomatic activity in Washington, and the South Korean government gained a lot of self-confidence from this success. Progress in dialogue with North Korea, in turn, influenced the Moon administration’s posture toward Japan. It was because Seoul’s success in Washington meant, at the same time, a reduction in the influence in Washington of Japan, which had been opposed to dialogue with the North. Having lost its influence over South Korea, Japan also lost its influence on Washington. In February 2019, when the Japan-ROK relationship was worsening, an incident occurred where an advisor to Moon Jae-in, who was visiting Japan, asserted that “Japan has no role in the North Korean question,” which gave a glimpse of how abruptly consciousness of Japan had shifted in the Moon administration by that time. As clarified above, accompanying the loss of importance for Japan in economics and security, we find a collapse in the environment in South Korea for regarding relations with Japan as significant or even showing concern about them. Yet, Japan retained considerable influence in international society, especially with its ally, the United States, and the Moon administration, therefore, could not but be concerned about that influence. However, in 2018, with apparent progress in talks with North Korea, the Moon administration came to have a lot more confidence in its own relationship with the United States. It reasoned that If Washington also saw no need to take Japan’s thinking into consideration, there was no need for Seoul to give it special concern regarding bilateral relations.21 It was free to vent its feelings as at no other time. After the paradigm in the South Korean government for relations with Japan was shattered in 2018, bilateral ties sharply deteriorated. We can take a look in some detail at the mechanisms. Even if the above types of explanations can explain the intensification of disputes, they cannot explain the frequency, increase, and outbreak of new issues. As the situation since the fall of 2018 demonstrates, there have been additions to the problems repeatedly discussed from the 1990s to date. Today there not only are the past themes of the Takeshima issue, the “comfort women” issue, the textbook question, and homage paid at the Yasukuni Shrine; there have also arisen “new issues” such as the conscripted labor issue and the Rising Sun flag issue, as well as the radar lock-in issue, which are not directly related. With almost no exception, these new issues are not connected to citizens’ movements inside Japan but are purely “of Korean origin.” Not only must we recognize how they prolong and deepen the disputes, it is necessary to uncover the mechanisms that lead to the outbreak of problems that are counted among the new issues. Critical is the fact that different groups of people have led the way on the new issues, chief among them the armed forces and the courts. The model for this is the Rising Sun flag issue.22 On Jeju Island in October 2018, the Korean navy asked Japan’s SDF ship to restrain from showing its flag before it was to participate in an international fleet review. When that was rejected, permission to participate was withdrawn. What matters here is that previously, exchanges between the two navies were common, and the display of Japan’s flag had not posed a problem. It is said that the ROK navy at first had the intention to permit the flag to be raised at the review.23 In spite of this, the navy made its request because citizens’ organizations in August around the time of the day commemorating liberation from colonial rule intensified their movement against the flag,24 in connection with questions raised by this movement regarding the fleet review.25 The original plan was withdrawn, and the feelings of the navy SDF were badly wounded, leading to a bilateral dispute and to loss of trust in the Korean side, which can be seen as partially paving the way to the shocking radar lock-in issue in December. It is important to recognize that the flag incident shows how Seoul treats bilateral relations at this time. From 2012 attention has risen in South Korea to the “Rising Sun” flag, especially after the Urawa against Jeonbuk soccer match in the Asia Champions League, when the fact that Urawa supporters were waving the flag aroused opposition, and over the intervening 7-year period, the movement against the flag has increased its influence over the Internet, spreading the interpretation in South Korea that the “Rising Sun“ flag is a “war criminal flag” comparable to the Nazi flag. This movement developed beyond sports arenas and the Internet and lacked any intermediary “pro-movement organization” such as the Council for the Women Drafted for Military Sexual Slavery by Japan, which performed this role on the “comfort women” issue. This “bottom-up citizens’ movement” played a disruptive role in cooperative ties between the navies. Two preconditions existed for the emergence of the Rising Flag issue. First was the existence of a movement, steeped in general historical consciousness that the colonial control was “evil,” attempting to sweep away everything connected to it. The preface to the Korean constitution expresses the view that the Japanese colonial control was illegal, and this thinking became part of the “essence “of the establishment of the South Korean state, which makes it difficult for the Korean people to directly oppose that. When actions in accord with this logic are taken, under the pressure from a movement, as in the case of a fleet review, it is hard to be opposed. There is also a second reason not stemming from a view of the “national essence.” It is a factor that interferes with the elites taking an action, removing its incentive to resist the pressure of citizens’ movements. It is the breakdown of the “national control system” and the “ideological governance” over Japan-ROK relations in South Korea. The working of this mechanism is vividly seen in the conscripted labor issue. Although the idea that Japan’s occupation was illegal had been around since the ROK was established in 1948 as a continuous part of the “national essence,” and salient to domestic debates, it was “tatemae (public stance)” rather than an active force in relations with Japan. The relationship had been heavily influenced by the foundation of the 1965 treaty and its attendant agreements. Once the importance of the relationship lost effect in South Korea, the elites lost incentive to stand in the way of activation of the most important “national essence” of the ROK, which brought about the collapse of the foundation of the relationship established in 1965. Legal logic could not suffice to block the force of arguments rooted in what the nation was really about. National identity trumped diplomatic legality. Finally, what is occurring in today’s South Korea was made possible by the loss of control by the elite of its ability to stop the “national essence” in various forms from impacting policy toward Japan. Without this, we could not imagine the possibility of ROK coast guard orders to stop Japanese fishing boats in waters between Japan and South Korea or the locked-in radar issue. Bilateral relations have shifted from strategic cooperation to strategic competition as the result of the two factors of diminished long-term importance for South Korea of the relationship and the short-term loss of influence by Japan over dealing with North Korea. Consequently, harsh positions toward Japan that had previously been constrained in the South have now erupted—viewed in Japan as occurring intentionally due to the ROK government playing the “anti-Japan” card—and the Japanese government and public opinion have, thus, grown more dissatisfied with South Korea, raising the level of distrust to a degree never before seen. This situation is significant in two respects. One, the past era when Japan and South Korea had shared strategic goals in Northeast Asia is over; an era of competing with different objectives has arrived. Additionally, the past vertical relationship is now being transformed into a level relationship as a result of long-term economic stagnation in Japan and continued, albeit slow, economic development in South Korea. Not only does Seoul have different goals than Tokyo, we need to consider how it and Tokyo will compete with each other in international society, beginning in Washington. This change is structural, not fleeting. It has become difficult any longer to expect a return to the past cooperative relationship between Japan and South Korea. 1. As has been widely reported, the legal meaning includes workers who have not been mobilized through “conscription,” e.g., the object of the court decision of October 2018 was workers who were mobilized prior to conscription, although the November ruling included those conscripted. 3. JoongAng Ilbo, Japanese edition, November 21, 2018. 4. Hankuk Ilbo, November 5, 2018. Also, see JoongAng Ilbo, April 1, 2019. 5. JoongAng Ilbo, December 23, 2018. 7. Interview on March 5, 2019 with someone affiliated with the SDF. 11. Kan Kimura, “Will the ‘Comfort Women’ Agreement Reduce Japan-ROK Mutual Distrust?” Joint U.S. Korea Academic Studies, 201. 12. Jij tsushin, December 3, 2018. 15. Jiji tsushin, January 10, 2019. 16. Kan Kimura, The Burden of the Past: Problems of Historical Perception in Japan-Korea Relations, (Ann Arbor: University of Michigan Press, 2019); and Kan Kimura, “Discovery of Disputes: Collective Memories on Textbooks and Japanese-South Korean Relations,” Journal of Korean Studies; 17(1), Spring 2012. 17. A representative case is what happened directly after the first historical textbook dispute in 1982, with the “Overcome Japan movement” on the stage of Chosun Ilbo. A campaign ensued stressing the importance of Japan for South Korea under the slogan “in order to overcome Japan one must know Japan” in the form of collective backing of the political circles in the Korea. Reflection of National Identity,” in Gilbert Rozman, ed., Joint U.S. Korea Academic Studies, 2016 (Washington, DC: Korea Economic Institute in America, 2016). 21. Kimura Kan, “文在寅政権を理解するために知るべき韓国の’歴史的高揚感’の実態,” Nikkei Business, April 3, 2019. 22. Kimura Kan, “旭日旗問題に見る韓国ナショナリズムの新側面,” Kokusai Kyoroku Ronshu, 27(1). 23. JoongAng Ilbo, Japanese edition, September 6, 2018. 24. Herald Kyongjae, August 1, 2018.